Earlier this week, Star 88.3 personality Melissa Montana had the opportunity to talk with breast cancer survivor, Denise Deeds. Denise shares about a monthly support group that she leads and the important role support groups play when someone goes through that journey. Denise and Melissa also talk about the October "Lunch with Friends" Luncheon that is coming up and what guests can expect. Click here to go to the Star 88.3 website and listen to the interview. Francine's Friends is proud to have Star 88.3 as a media sponsor for this year's "Lunch with Friends". Tickets are $75 and all proceeds go to help cover the cost of mammograms. This year promises to be an exciting year as Francine's Friends welcomes back Colleen Murray and Robyn Scott of Chicago’s Second City for a true "red carpet" treatment with our eight special survivors. Guests will also hear from Dr. Adeline Deladisma of Indiana Surgical Specialists (ISS) and the AAMC 2011-2012 Breast Center Fellow. Plus, you'll hear more from Denise and others as they walk the red carpet and show off their newly acquired fashion “wow” under the direction of Nancy Nokaya, owner, Essentials and Frosting; with help from local area retailers, and hair and make-up professionals! For more information on how you can attend, contact Jeanne Garton (625-3532 or jeannegarton@aol.com) or Sharon Eisbart (432-2252 or secorporateart@yahoo.com). 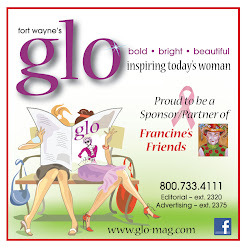 And be sure to tune into Star 88.3 between now and Oct. 12 to hear more about our upcoming event and Francine's Friends!